Protected resources can run on the MobileFirst Server (such as Adapters), or on external servers. You can protect resources on external servers by using the validation modules that are provided with Mobile Foundation. In this tutorial, you learn how to protect an external resource server by implementing a filter that validates a MobileFirst access token. You can implement such protection either entirely with custom code, or by using one of the Mobile Foundation helper libraries that encapsulate part of the flow. Understanding of the MobileFirst security framework. 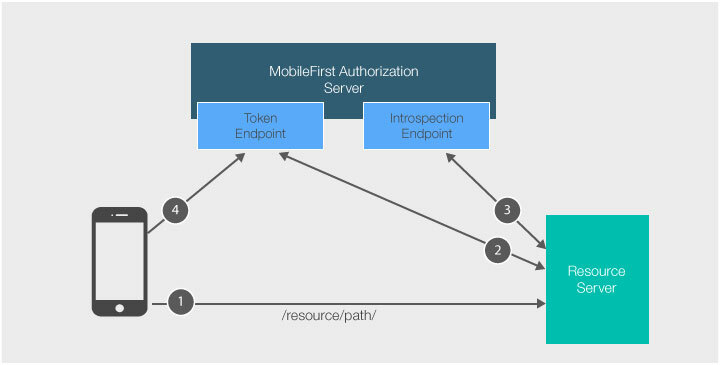 The MobileFirst Server has a component called the introspection endpoint which is capable of validating and extracting data from a MobileFirst access token. This introspection endpoint is available via a REST API. An application with the Mobile Foundation client SDK makes a resource request call (or any HTTP request) to a protected resource with or without the Authorization header (client access token). To communicate with the introspection endpoint, the filter on the resource server needs to obtain a separate token for itself (see the confidential client section). The filter on the resource server extracts the client access token from step 1, and sends it to the introspection endpoint for validation. If the MobileFirst Authorization Server determined that the token is invalid (or doesn’t exist), the resource server redirects the client to obtain a new token for the required scope. This part happens internally when the MobileFirst lient SDK is used. Because the introspection endpoint is an internal resource protected by the scope authorization.introspect, the resource server needs to obtain a separate token in order to send any data to it. If you attempt to make a request to the introspection endpoint without an authorization header, a 401 response is returned. For the external resource server to be able to request a token for the authorization.introspect scope, the server needs to be registered as a confidential client via the MobileFirst Operations Console. Learn more in the Confidential Clients tutorial. 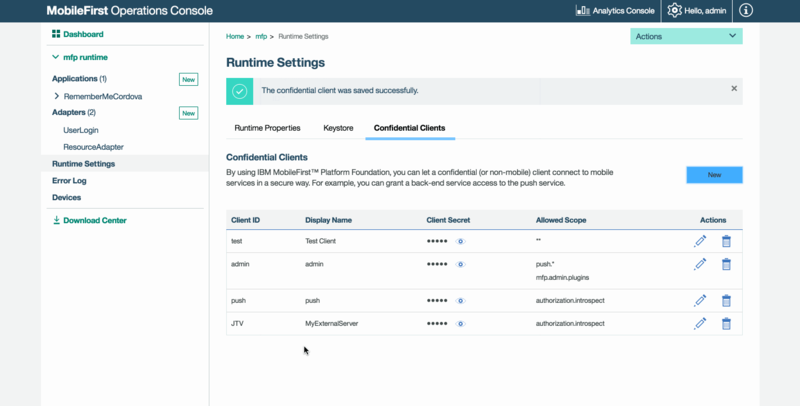 In the MobileFirst Operations Console, under Settings → Confidential Clients, add a new entry. Choose a client Secret and API secret value. Make sure to set authorization.introspect as the Allowed Scope. This flow can be implemented manually by making HTTP requests directly to the various REST APIs (see documentation).